I’m not sure if it’s because Easter is in late April this year or if it’s just my general frame of mind, but I don’t feel like my heart is properly prepared for this season. In case you’re in the same boat, I came up with a plan. I’m challenging myself to think about all that Jesus’ death accomplished. There’s not enough room to cover every aspect of that here, so I’m focusing specifically on what Jesus’ blood did for us. 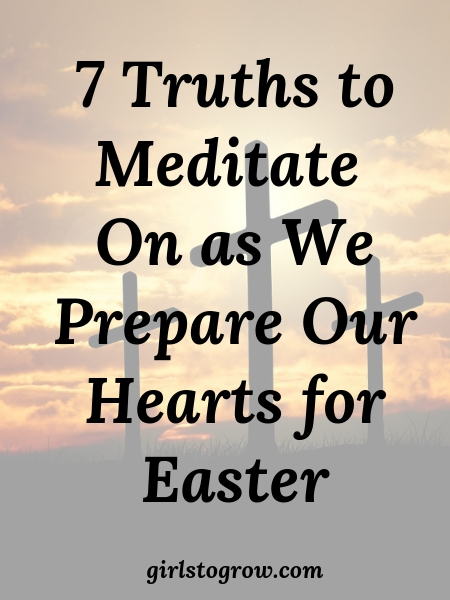 None of these truths are likely new to us, but hopefully as we meditate on them, we’ll realize anew the redemptive work that was finished at the cross. 1. No matter how wicked we’ve been or how many times we’ve sinned, Jesus’ blood cleanses us. 2. The blood of Jesus is the only thing that could redeem us. It is pure and precious. 3. Jesus loved us so much that He willingly shed His own blood for us. 4. It’s the richness of God’s grace that allows us to be redeemed and forgiven. 5. Our redemption is eternal. His blood bought us a life with Him that will never end. 6. Because of Jesus’ blood, we can have fellowship with God. 7. Because of Jesus’ blood, we can have fellowship with other believers. And just for a bonus truth, I thought I’d throw in an appropriate hymn to remind us that Jesus paid for ALL of our sins. Don’t let Satan throw guilt your way! Jesus’ blood covers every sin. And because He paid it all, how much we should want to love and serve Him. May you be blessed and encouraged as you think about Christ’s death and resurrection over these next few days! Who Was at the Tomb That First Easter Morning? Thank you for this refresher! I don’t feel I’m prepared for Easter, either. I think it is ironic that Jesus’ blood washes us white as snow. That has always struck me as amazingly miraculous! This morning I started reading Bible chapters about the crucifixion, then I’ll read resurrection chapters this weekend. Such a touching reminder of all that Christ suffered for us!! Love that memory with your Grandmommy! !